AthTek Skype Recorder has been updated to v7.1. The new version doesn’t depend on Skype desktop APIs to work. Any of our users including free trial users, is welcome to download and install the latest version 7.1 in high quality Skype call recording. Skype has stopped supporting Skype v7.16 or older. It is recommended to upgrade Skype to the latest version either. 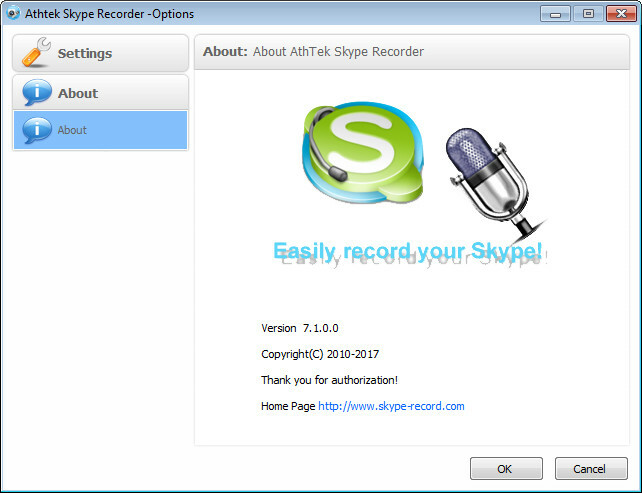 Please go to the download page to download AthTek Skype Recorder v7.1. * Be compatible with the latest version of Skype. Skype’s desktop APIs ceased to work since March 1, 2017. All Skype recorder programs which were developed on desktop APIs dead then. AthTek find a new way to capture Skype calls and the new solution doesn’t depend on Skype desktop APIs. * Optimize the audio recording quality. AthTek Skype Recorder has the best recording quality. This time, we upgrade the solution in audio recording. Audio will be captured directly through sound card. Thus it will get the original audio source in call recording. We have just released AthTek Skype Recorder for Mac. If you are using Skype on Mac, you can use AthTek Skype Recorder for Mac to record Skype calls now. We strongly recommend that you download it to your Mac and try it by yourself. Currently the application can only record audio in Skype calls. We will make it to be a full functional Skype call recording program, just like what we did on Windows. AthTek Skype Recorder for Mac has some similar features just like its Windows version. * Automatically records Skype calls. It starts automatically with Skype and get the entire conversation recorded. No matter you are in the office or at home, the application will help you to take audio memos to any Skype call. * Saves recordings in high quality audio files. It has the same audio recording quality as its Windows version. This means AthTek Skype Recorder for Mac supports Skype call recording for broadcasting. * Adds memos to each recording. It supports to add text memos to each recording. It would be a good habit to add some text tags to the call. * Supports smart recording panel. When it was in recording, a smart recording box will popup for you to easily control the recording course. 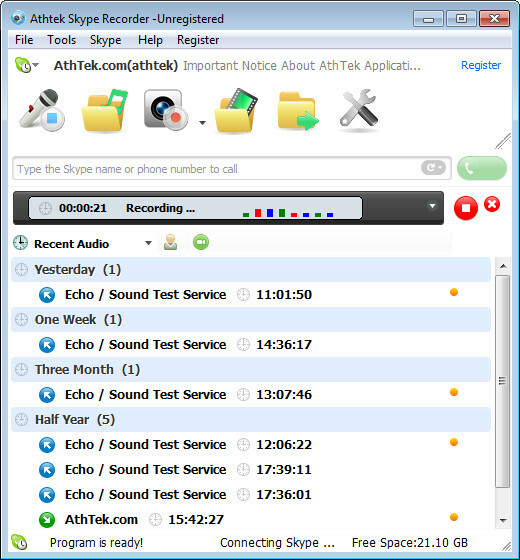 We have updated AthTek Call Recorder for Skype to version 6.90 with some new features included. The new version is available for downloading since July 15, 2015. Sometimes the auto update could failed to work on your computer, but you can always download the latest version at our official website at any time you wish. All users including free trial users are allowed to download and use AthTek Call Recorder for Skype 6.90 for free. If you are using an old version of Call Recorder for Skype, we highly recommend you to download and install the latest version for Skype call recording. * Optimizes the hot keys section in hidden mode. In previous version users can set the popup hot keys to any key on the keyboard, but sometimes the hot keys doesn’t work on some special keys. In AthTek Call Recorder for Skype v6.90 we limit it to 26 English letters and it will be easier for user to pop up the recorder on to desktop. * Supports higher sample rates up to 48000Hz. 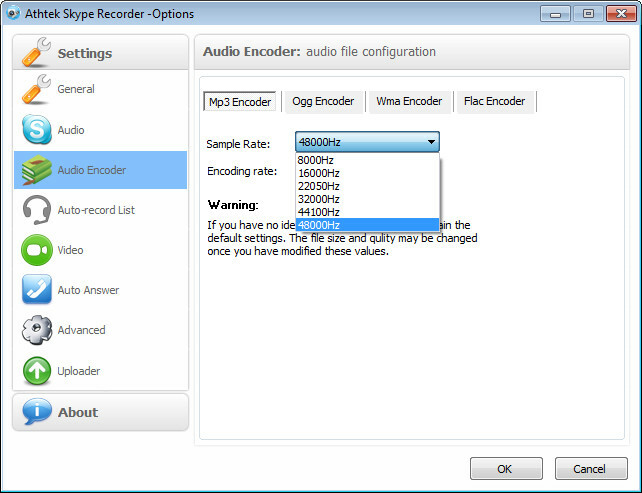 In AthTek Call Recorder for Skype v6.90, users are allowed to use maximum 48000Hz sample rate for broadcasting. If you are a broadcaster, this change will definitely produce better audio quality for your work. You can find this change in [Tools] > [Options…] > [Audio Encoder]. * Adds an option to start recording when answered. 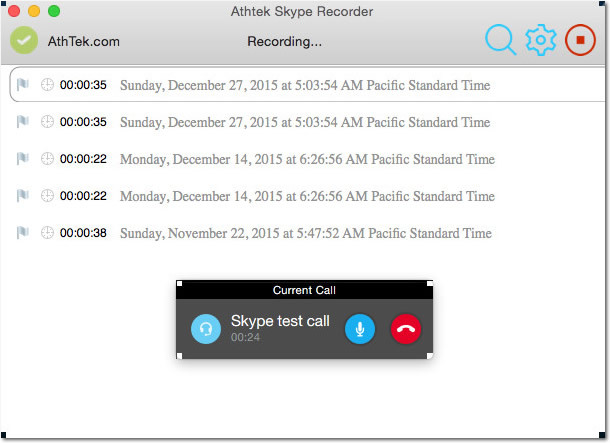 As default, AthTek Call Recorder for Skype will start to record the call since you start the call. But if you have selected this option, recorder will start to record only when the call was answered. * Intelligently speeds up the recorder when necessary. The new AthTek Call Recorder for Skype will remind you to transfer the old recordings to another place when there were too many items or they took too much space. This will help you to speed up AthTek Call Recorder for Skype to get a better performance. * Unselected auto notification is as a default. 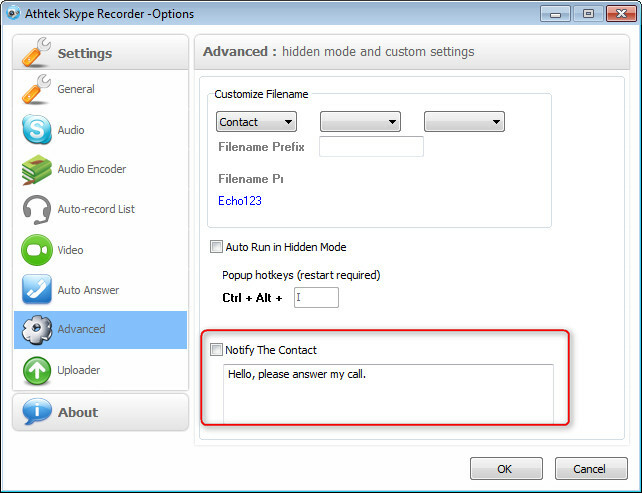 In AthTek Call Recorder for Skype v6.90, we make the auto notification to be unselected as default. We found some users don’t even know this message will be sent out automatically when they were using AthTek Call Recorder for Skype, so that we decide to unselect it in the new version. [PDF] Although we have published an instruction about how to register AthTek Skype Recorder before, some of users still failed to register the license correctly. Most of time, the issue is a wrong license key generated by a wrong Skype ID or PC Code. But sometimes the issue is not so easy to be found. 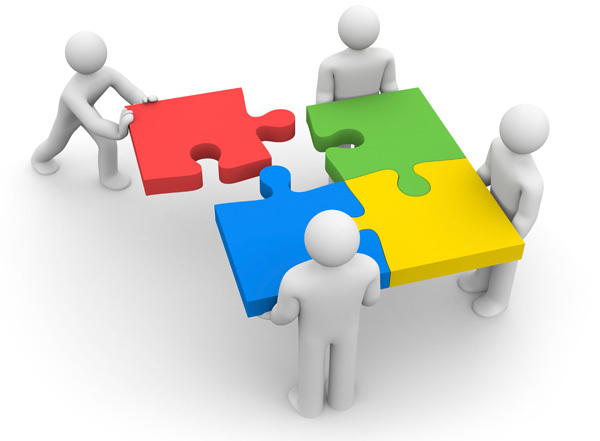 In this article, you will read the troubleshooting method for registration issues and the solutions. 1. Check the Skype ID or PC Code– is it exactly the same to what you filled when generating the key? 90% of the registration issues are because of the buyer has generated a wrong license key by a wrong Skype ID or PC Code. 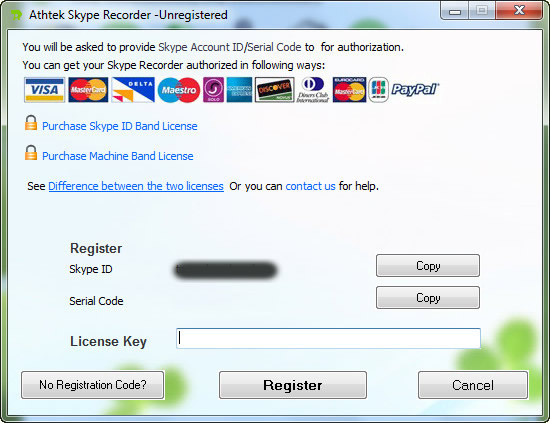 You can find the correct Skype ID and PC Code in [Skype Recorder] > [Help] > [Register]. Also please check that if you have bought an ID-License but input a PC Code to generate the license key. 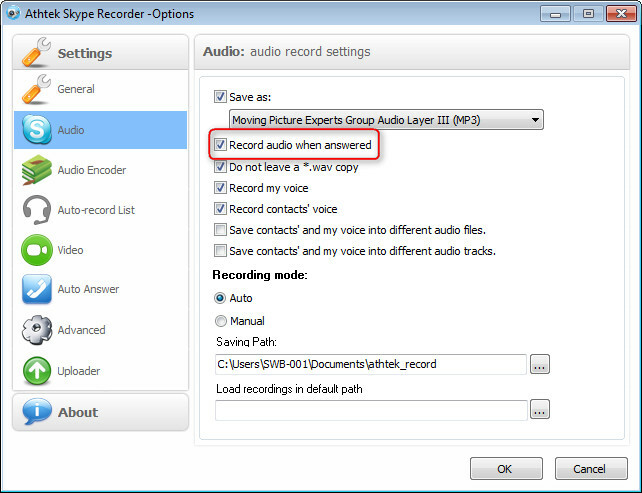 AthTek provides 2 license types for Skype Recorder pro. It is highly recommended to read the instruction to each license before placing an order to it. 2. The license was blocked by a security program from authorization. Accidentally, the license may be blocked by the security program. 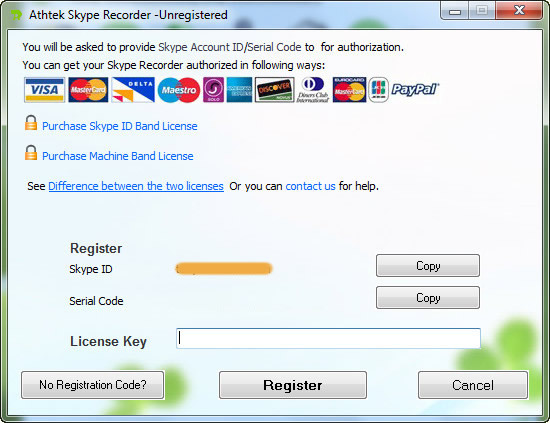 Even you got a correct license key, you cannot register AthTek Skype Recorder successfully in blocking status. The only solution to this issue is to close all the security programs and try again. When the Skype Recorder has been licensed successfully, you can restart the security programs. 3. Sometimes you can register AthTek Skype Recorder with the license key, but when you restart the computer it gets back to trial. When you are facing this registration issue, please go to [Skype Recorder] > [Help] > [Register] and check the PC Code. If the PC Code disappeared, your were running VPN on the computer. You have to close the VPN to register AthTek Skype Recorder. Without VPN, you can register AthTek Skype Recorder without any problem. The previous special offer for AthTek NetWalk Enterprise Edition has expired, and a new special offer for Skype Parental Control started in July. Anyone who buys a license for Skype Parental Control will save $10 from the official price now. 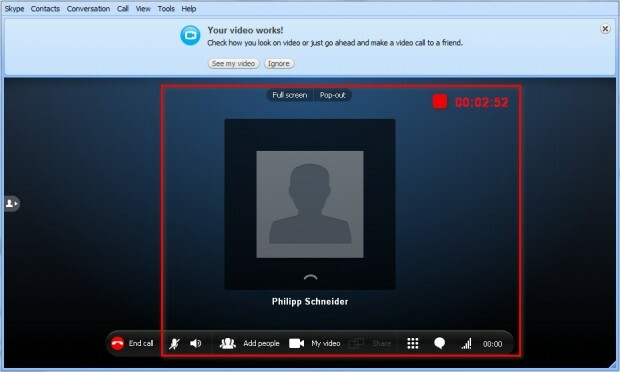 If you are looking for a reliable and invisible parental control tool, SkypePC is definitely a recommended one to you. Skype Parental Control (SkypePC) is a Windows program for parents whose kids who use Skype. It runs invisibly on the kids’ computer and record what ever they talk over Skype. It will send the recordings to parents through email automatically. Even the parents were in China, they can get timely Skype usage reports of their kids through email. SkypePC uses 2-Step Verification to protect itself from detecting. Even the kids accidentally pressed the hot keys, they cannot pop up SkypePC without a correct unlock password. We highly recommend you to download the free trial for a test before you buy it in special offer. [PDF] Peter used to play pranks on his friends in Skype calls. He pretends to be a girl and talk to all his male friend in contact list of Skype. When his friends decide to date that “girl”, Peter will “happen” to be at the date place and make a good laugh at his friend. Why does Peter always succeed in Skype pranks? Peter uses Skype Voice Changer to change his voice from male to female in Skype calls. In this article, you will learn how Peter changes his voice from male to female by Skype Voice Changer. First of all, Peter will sign up a new Skype account for prank. Obviously, if Peter uses his primary Skype account for prank, he will be busted in seconds. Secondly, Peter will license his Skype Voice Changer. If Peter buys an ID-License, he needs to generate the license key by the new Skype account ID. If Peter buys a PC-License, his license will be associated to the computer. After that, Peter starts to find a suitable voice pitch for prank in Skype Voice Changer. 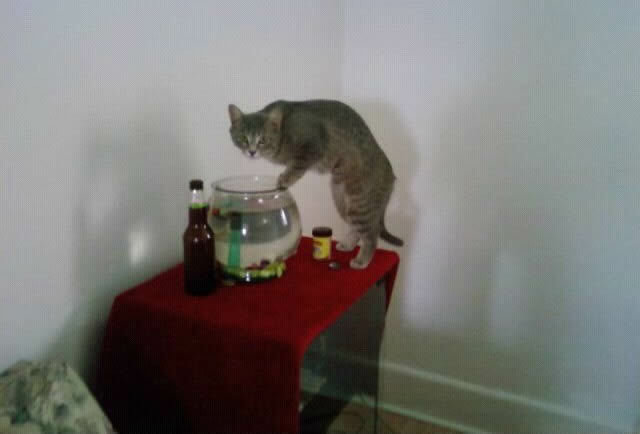 At the beginning Peter clicked on CAT to test the voice, but found it was too high to sound like a girl. Then he clicks on the Lower button and test the voice again and again. Finally Peter gets a suitable voice for prank. Peter goes to the Record Setting Tab and turn off the auto notification. If he didn’t turn off auto notification, program would automatically send out a message to his friend to acknowledge this prank call after hung up. Then Peter adds some male friends on his new Skype account and imitates a girl in Skype call. When he is using Skype Voice Changer, Peter sounds like a real girl. Now you have learnt how Peter changed his voice from male to female by Skype Voice Changer. Quite easy, isn’t it? We have released a major update to Reinstall DirectX EZ on May 11, 2015. Reinstall DirectX EZ 6.3 has updated the core database of DirectX program and optimized the DirectX repair process for better user experience. All users including free trial ones are allowed to download and install this latest version for DirectX maintenance. If you are looking for a solution to DirectX problem in playing NFS Rivals and/or Battlefield, Reinstall DirectX EZ 6.3 can definitely save you from hell. * DirectX compatible database updates– important. Windows has updated its components and databases in DirectX and Reinstall DirectX EZ 6.3 includes all new updates. Reinstall DirectX EZ will always be the final solution to any possible DirectX problem. * Auto detects Windows setup disc. Previously, users may need to choose Windows setup disc manually in DirectX repair. 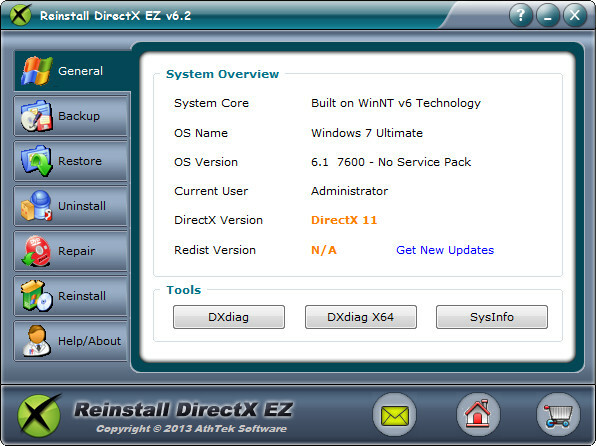 With Reinstall DirectX EZ 6.3, program will detect and select Windows setup disc automatically. 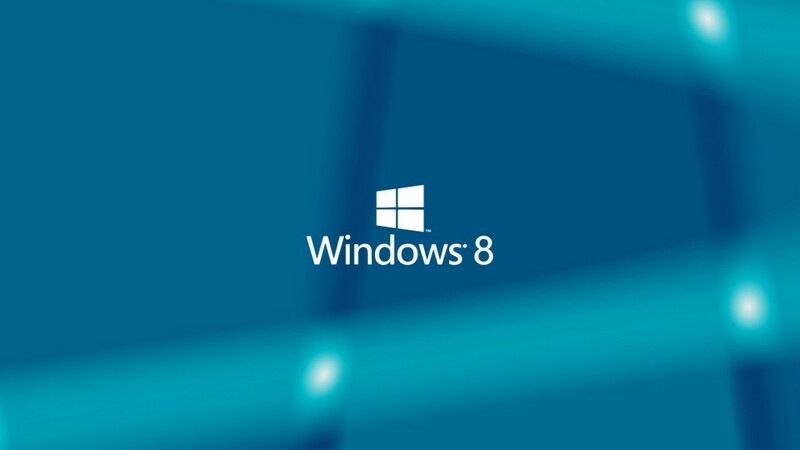 If you don’t have a Windows setup disc, we can make a system package for our buyers. [PDF] Software users can find 3 kinds of voice changer software and read the differences between these voice changer software at AthTek.com. If you are looking for a voice changer for prank on Skype, Skype Voice Changer is exact the one we highly recommend. This is not only because Skype Voice Changer is developed particularly for Skype pranks, but also because Skype Voice Changer has the best compatibility and capacity. 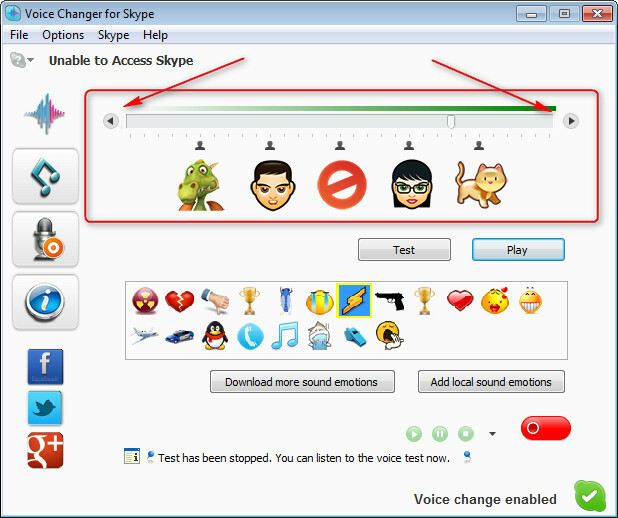 In this article, you will read the reasons for choosing Skype Voice Changer. 1. Good compatibility with Skype. No matter a latest version or an old version Skype, AthTek Skype Voice Changer is fully compatible with all Skype versions. This is because Skype Voice Changer was developed based on APIs. This makes Skype Voice Changer a good compatibility with all Skype versions. 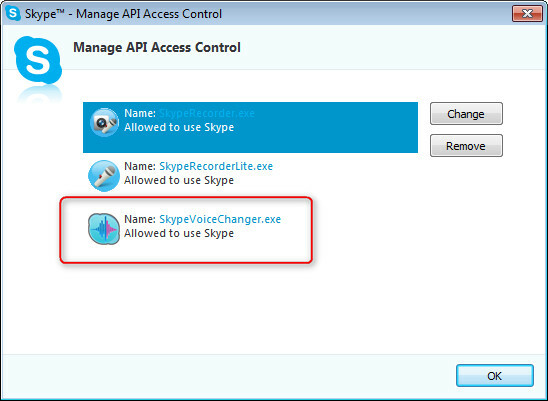 Other Skype Voice Changer software doesn’t require Skype API to run. Skype Voice Changer enables user to send various sound emotions to contacts. Sound emotions can definitely make Skype chats interesting and make an audible response instead of text chat. 3. Integrated Skype Call Recorder. 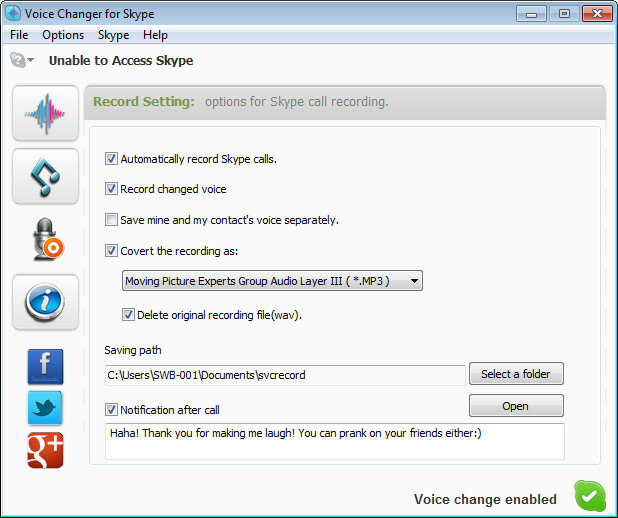 Skype Voice Changer integrates AthTek Skype Recorder Lite for prank calls recording. It has a same high recording quality to AthTek Skype Recorder Lite, but won’t charge additional money to use the recording functions. 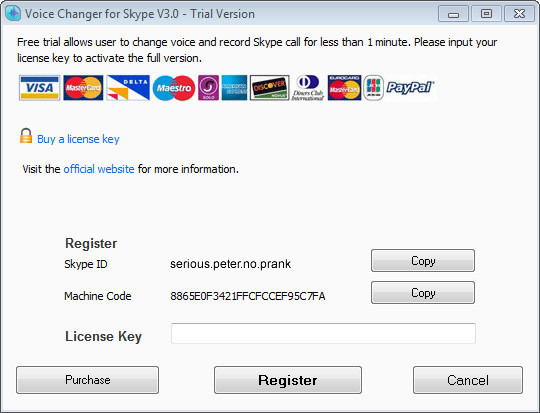 Users can feel free to record prank calls by Skype Voice Changer. If you are looking for a reliable voice changing program for Skype prank, Skype Voice Changer is definitely the best choice for you! [PDF] AthTek NetWalk supports both real-time and postmortem analysis. Do you know what the differences are? Most of time, real-time and postmortem analysis shares the same template to analyze the traffic data. Real-time traffic analysis shows dynamic trends of the entire network, while postmortem traffic analysis shows exactly what has happened in this network. In this article, you will read the main differences between real-time traffic analysis and packet analysis in AthTek NetWalk. In Overview section, real-time traffic shows current bandwidth usage and accumulated traffic data. But if you opened a captured packet in AthTek NetWalk, you will see fixed values of the network traffic and these values tell you exactly what has happened during the capturing period. When you opened a captured file in AthTek NetWalk, you will see a new tab named “Packets” created on left. Real-time traffic analysis doesn’t support Packets tab. In Packets tab, network administrators can read all the communication details including requested IP addresses, ports, protocol, etc. If a common packet analyzer enables network administrator to see a naked data, AthTek NetWalk enables users to see a reliable anatomical traffic data through detail and hex view tool. There are 3 layers in Layered View section: Application, Net&Transport and Physical. A significant different is, you can see communication flows in postmortem packet analysis. In Events tab, network administrator can jump to the communication flow when it is a postmortem packet analysis. In Matrix Map, real-time analysis only marks active connections in green, while postmortem analysis marks all successful connections in green. In short, postmortem analysis enables network administrators to see all communication details happened on the network. All you need to do is to capture packets and open the captured file in AthTek NetWalk.